Yahoo reported a 6 percent drop in revenue for the fourth quarter as sales of its display and search ads dropped compared to last year. Revenue for the quarter ended Dec. 31, 2013, was US$1.266 billion, down 6 percent compared to the same period the previous year, Yahoo said Tuesday. Excluding traffic acquisition costs, revenue was down 2 percent, though in line with the expectations of analysts polled by Thomson Reuters. Yahoo's net earnings for the quarter rose by 28 percent to $348 million, including a $49 million net gain from the sale of patents. GAAP earnings per share were $0.33. For the full year, Yahoo's total sales also dropped by 6 percent to $4.68 billion, the company reported. Yahoo's net earnings for 2013 were $1.366 billion, a 65 percent drop compared to 2012, when Yahoo reaped big rewards from selling a chunk of its shares in Asian e-commerce giant Alibaba. Yahoo has struggled in recent years to grow its digital ad sales while competitors like Google and Facebook have made gains in those areas. Since Marissa Mayer took the helm as CEO in 2012, she has aimed to make Yahoo cool again with a string of redesigns, acquisitions and some high-profile hires like TV personality Katie Couric. Some of those moves, like Yahoo's acquisition of Tumblr, may have netted the company more users and more developer talent, but not yet an upswing in advertising sales. Yahoo's investments and its products, which now include revamped versions of Flickr and Yahoo Mail, have helped to establish "a strong foundation for revenue growth," Mayer said Tuesday in the company's earnings announcement. "I'm encouraged by Yahoo's performance in Q4 and 2013 overall," she said. 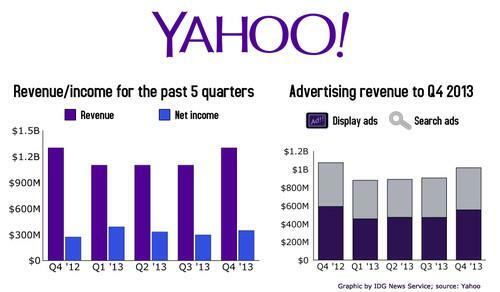 But for the fourth quarter, Yahoo's performance in the area of digital advertising was not stellar. While the Internet company reported some increases in the number of ads sold, the money Yahoo generated from those products dropped. In display, the number of ads sold increased by roughly 3 percent (excluding Korea, where Yahoo shuttered its business at the end of 2012), but display ad revenue dropped by 6 percent to $553 million, Yahoo reported. Over the past year Yahoo has tried to energize its advertising business, partly by introducing "native" ads to some of its properties. Meanwhile, Yahoo also reported a 17 percent increase in paid clicks in search ads, excluding Korea. The price per click, however, dropped by about 3 percent (excluding Korea), while search ad revenue also fell by 4 percent. Shares of Yahoo stock were trading at $38.22 after the market close on Tuesday, up slightly from closing at $36.65 on Monday. Mayer was due to address investors and financial analysts Tuesday afternoon during an earnings conference call. That call can be accessed via webcast here as a news anchor-style video, as Mayer prefers that to the traditional strictly call-in format.